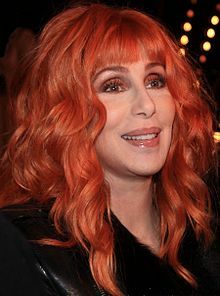 Cherilyn Sarkisian (better known as Cher; born on May 20, 1946) is a American actress, singer, songwriter, author and entertainer. She has won an Academy Award, a Grammy Award, an Emmy Award and three Golden Globe Awards. She is well known for her deep contralto vocal range. Cher first became well known in 1965 as one half of the pop/rock duo Sonny & Cher. She has also released 25 albums as a solo artist, and has 22 Billboard Top 40 entries over her career. These include twelve Top 10 singles and five number one singles. ↑ Holden, Stephen (18 December 1997). "CABARET REVIEW; On Life's Rough-and-Tumble, via Mama's Tender Heart". ESPN.com. Retrieved 2 July 2010.
cher.com — Cher's official web site. officialcherfanclub.com — Cher's official Fan Club web site. ccakids.com — Children's Craniofacial Association. National Chairperson: Cher. cherconvention.com — Cher Convention Foundation dedicated to raising funds for CCA kids.